As the climate changes, resource managers are increasingly challenged by limited knowledge of where and when streams and rivers will maintain streamflow. A new paper on NW CASC-funded research details the USGS PRObability of Streamflow PERmanence (PROSPER) model, a regional model that provides information about where streams supported year round flow on a year-to-year basis for 2004-2016. This model provides streamflow permanence information for the Northwest at an unprecedented spatial scale (30 m channel segments) and temporal resolution (annual) for applications in water resource management and species conservation. Streamflow permanence describes the extent to which rivers and streams maintain flowing surface water, which directly controls how nutrients and organisms move through a river network. Information about streamflow permanence is used to inform aquatic and terrestrial species vulnerability assessments, land management decisions and water quality regulations. 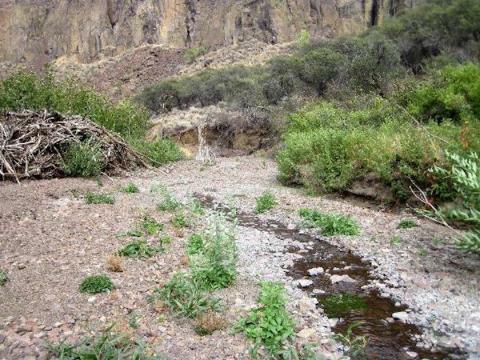 Although there are a variety of methods for determining streamflow permanence at smaller scales, there is a lack of streamflow permanence observations at regional scales or that account for year-to-year climatic conditions. Addressing this gap, the PROSPER model pairs existing streamflow permanence observations with modeling to allow analysis of streamflow permanence at a regional scale. The new paper, published in the Journal of Hydrology X, introduces the PROSPER model and demonstrates its use by analyzing streamflow permanence in three Northwest river basins. Since predictions of streamflow permanence from the PROSPER model are publicly available through the USGS StreamStats platform, it can be used to help managers identify streams that are resilient to drought conditions, enabling them to focus limited resources on watersheds that support populations of threatened species.